This case was designed for Full Flood Lighting to provide a central storage unit when they are on the road. 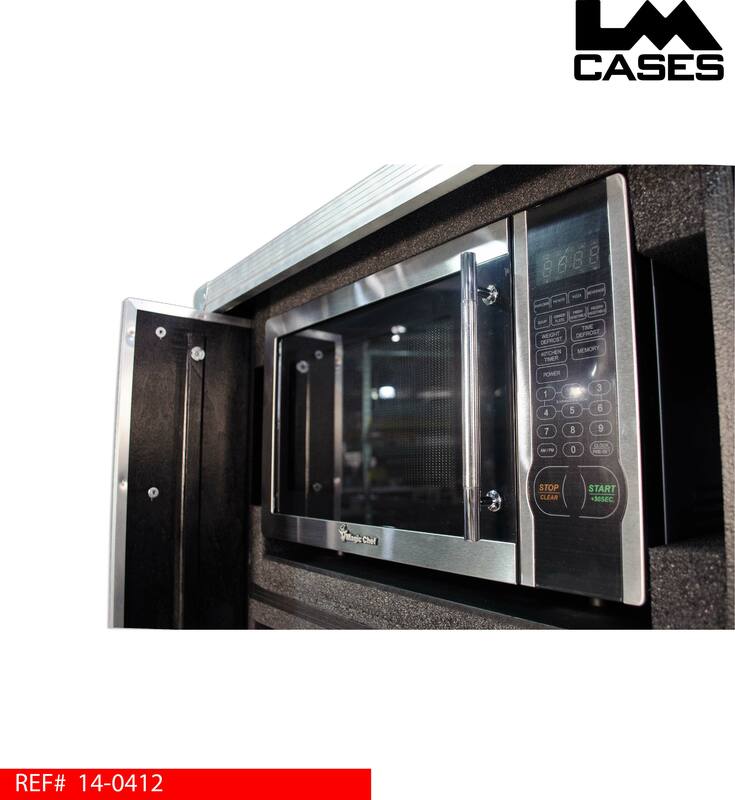 The case holds a microwave, refrigerator, printer, Keurig beverage maker, Nespresso espresso machine, a folding table, wireless router, and drawers to hold everything from ketchup and mustard; to gel paper. 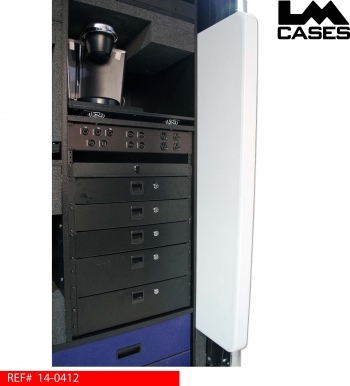 The standout feature of this case are the pocket doors, which allow the case doors to slide into the side of the case without the need to store lids. 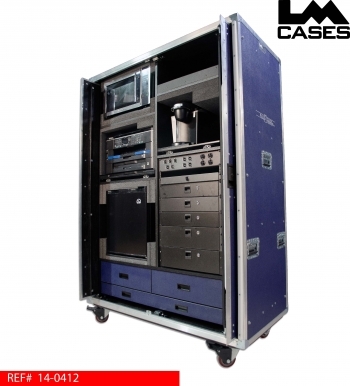 The case is split into two zones: the craft services zone and the storage zone. 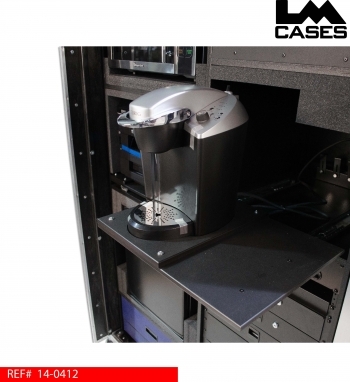 The craft services portion of the case features standard amenities like a microwave and a refrigerator and also upgraded amenities like a commercial grade Keurig, and a Nespresso espresso machine. 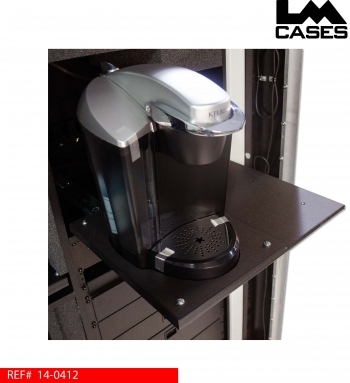 The coffee machines are mounted on a slide tray to help dissipate heat and steam while in use. Each machine is held in place by a custom CNC bracket (Nespresso not pictured) that contours the shape of the unit to prevent the machines from sliding off the shelf. The machines are held down into their custom holders by foam blocks that touch each machine when the slide out shelf is retracted. The storage zone is comprised of an open cubby compartment, hanging jacket/table compartment, rack mounted drawers and custom built drawers. The open cubby compartment is located above the coffee machine section and provides storage for boxes of paper and other large items that wont fit in the drawers. Provided with the case is a standard 6' folding table that stores vertically next to the rack section. 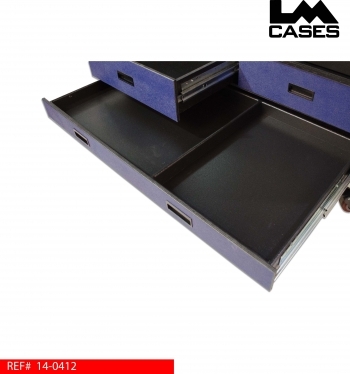 The table storage compartment features a hanging clothes bar to give the user a spot to store 2 suit jackets in the compartment when the table is removed. 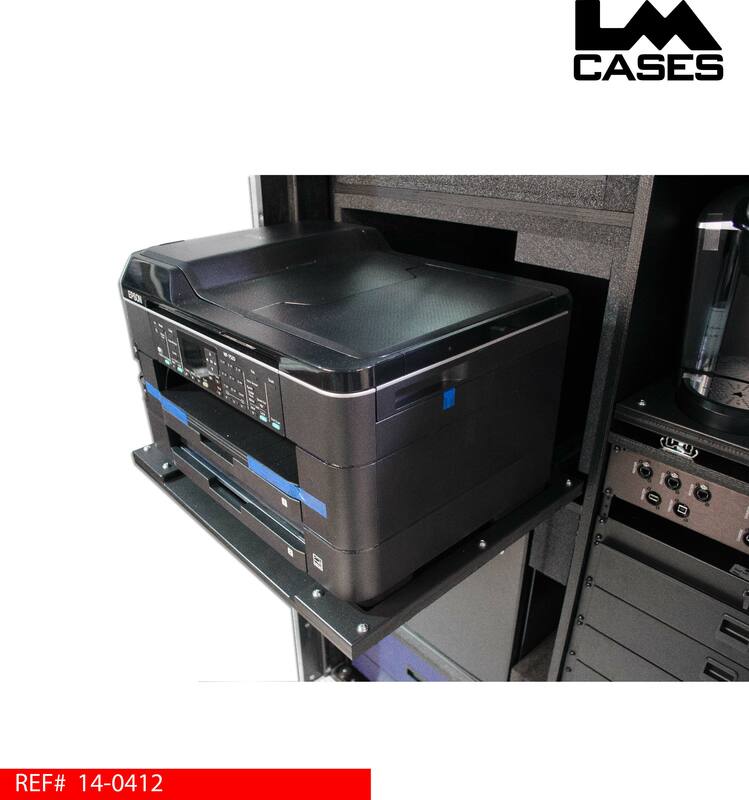 Also provided is a Epson laser printer mounted on a slide out shelf featuring a contoured bracket that holds the unit in place. 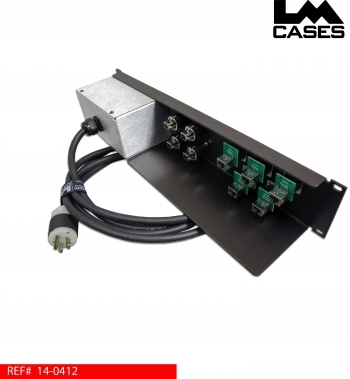 Power and signal cables are routed to a centrally located IO panel located in the modular rack section. 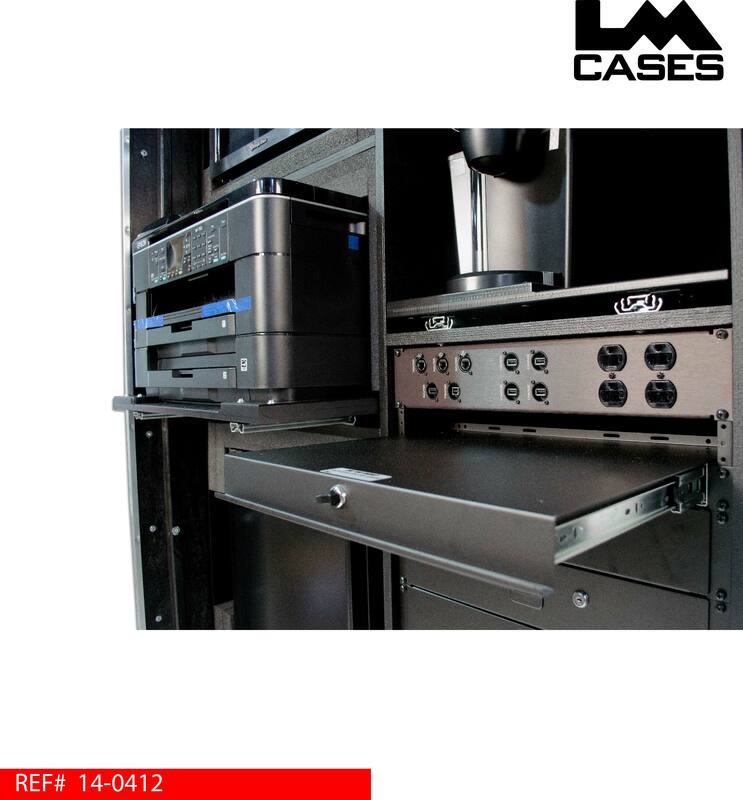 The rack section provides 16RU of modular storage which can change depending on what event the work box is sent to. A rack section allows Full Flood to use standard rack mountable shelves and drawers, as well as provide storage for rack mounted electronics if the need arises. The section is currently configured with 2 - 3RU 18" deep rack drawers, 3 - 2RU 18" deep rack drawers, a sliding shelf and a custom IO panel created by the LM Cases Custom Integration department. Below the rack section are 3 drawers built out of 1/2" Baltic Birch for storing large or heavy items like paper, laser printer toner and gaff tape; the large thin bottom drawer is designed to hold sheets of gel paper for lights. All 3 drawers are mounted on HD Accuride drawer glides and are finished with black texture coating. 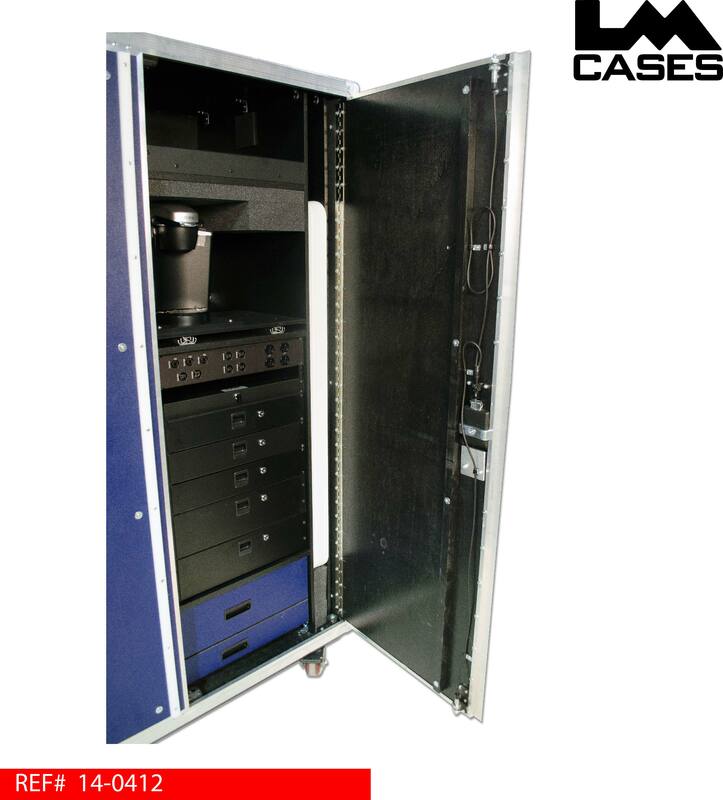 All electronics were installed by the LM Cases Custom Integration department. Each section features a locking power strip routed to a central power input panel. All internal wiring uses 12awg 3 conductor power cabling. A 2RU IO panel was built to provide 4 Edison outlets for power, 4 USB outlets for charging and 5 Cat5 jacks for wired Ethernet from an internal wifi router. 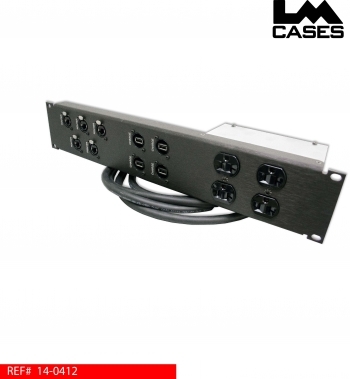 The panel is built out of .125" black anodized aluminum with laser etched labels and features a integrated shelf to mount a USB charging hub. 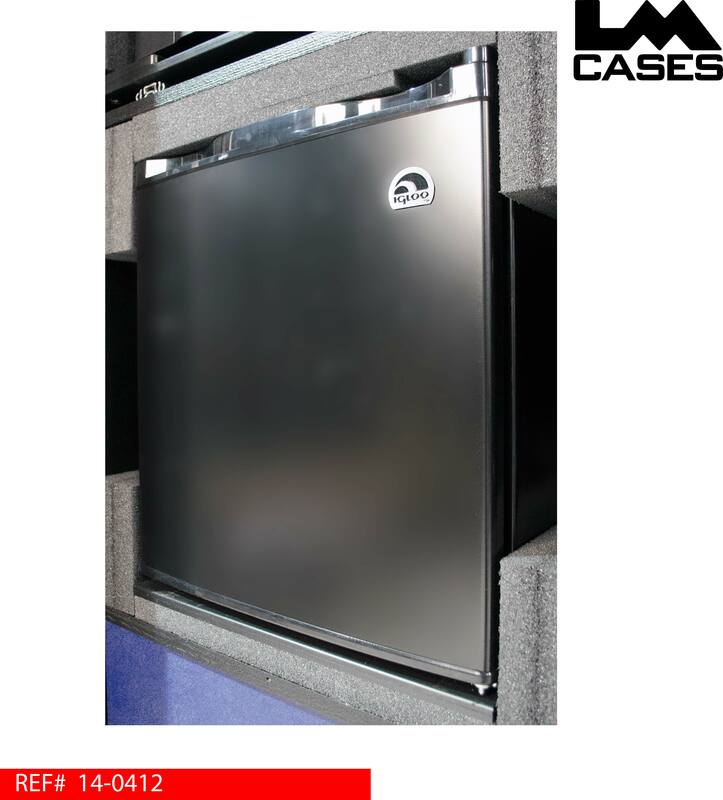 All power is terminated at a custom power box on the rear of the case that features a recessed Hubbell power inlet. 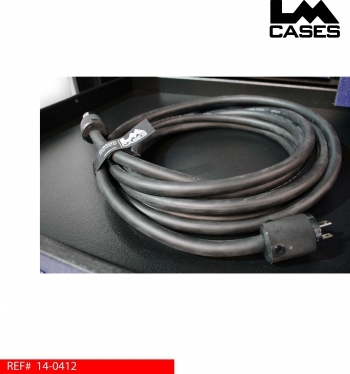 The CI department also built a 25' 12awg extension cord to provide power to the case. 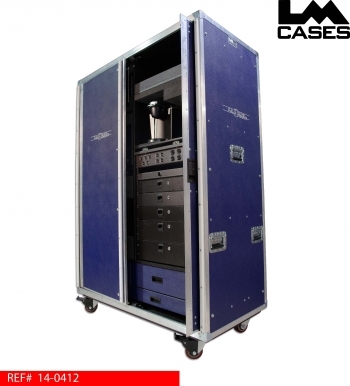 The exterior case is built out of 1/2" plywood laminated with dark blue ABS plastic. The case doors are mounted on custom fabricated aluminum rails that allow them to open and slide into the sides of the case. The doors lock via central mounted latching system that uses a single latch to operate 2 cable driven posts that fit into receiver brackets. This system allows both doors to be locked by a single latch. The case exterior also featured CNC routed vents over the electronics compartments to provide air flow when the appliances are running. The case is mounted on a steel box tube frame which allows the exterior shell to remain rigid on uneven surfaces. 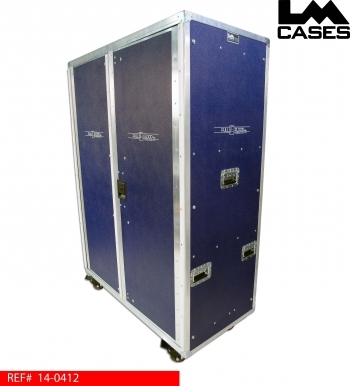 If the case flexes too much, the doors may not open or close; the steel frame adds enough strength to allow the doors to open and close freely with only 3 casters touching the ground! 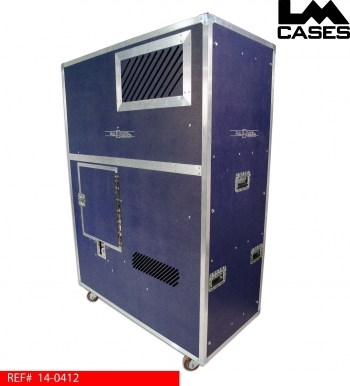 The case rides on 4" x 2" HD Colson casters and features custom silkscreens of the Full Flood logo. Special thanks to Full Flood for a great project!